Our formed plastic letters are the original "Gemini Letters". Made since 1963 out of C.A.B. (Cellulose Acetate Butyrate); these letters are the utmost in versatility. Formed Letters, while the standard for many local business, can also be found on financial institutions, office parks, as well as many national retail chains. Their inexpensive molds make it easy to customize a letter style or logo for the perfect 3-D sign. Formed Letters also provide the deepest dimension for the money. Over 140 standard styles and 38 standard colors. Easy customization for your style or logo. Custom painting to match your specific color. Simplest installations for any mounting surface. Choose from flat, round or sculptured faces. Endures even the harshest conditions. Best dimension for the money. Quick delivery gives you instant results. Made from a renewable resource (non-petroleum) plastic. Where to use Formed Plastic Letters and Logos. When depth is required in letterstyle and/or logo. Virtually any business, organization or institution. When facing extreme time constraints. Under all weather and environmental conditions. When letter height up to 60" is required. 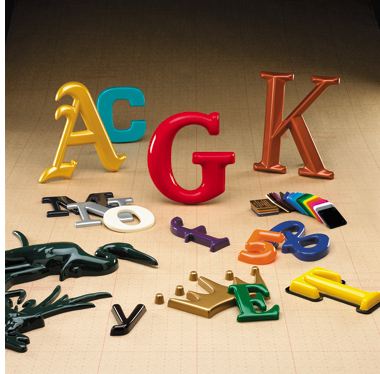 For examples of our formed plastic lettering, please visit our Product Gallery.